Is creating content for your social media causing you stress and making you feel overwhelmed? Today, I’m going to share how you can change your perspective on social media; take back your time and simplify everything in your business, so you can focus on what matters most. 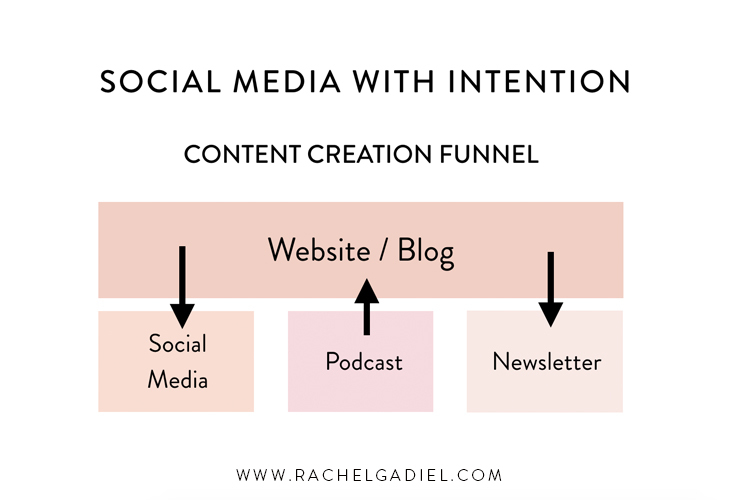 Whenever I teach my Blogging Workshop and we get to the section on social media, one of the most popular questions that inevitably comes up is: “how can I grow my social media following?”. I totally get why this question seems so important. Having a large social media following serves as a quick and immediate indicator that your brand is of significance and people should be paying attention. Having a large following on social media does not equate to having a successful and thriving business. In fact the opposite can be true. In the day and age that social media followers can be bought and that a lot of the so-called ‘engagement’ of liking and commenting is being run by automated programs, it can be hard to determine whether or not the engagement you receive is meaningful. Which in my view, is a significant not reason not to get caught up on likes and followers. Adding fuel to the fire are the constantly changing algorithms which ultimately mean that the content you’re creating is not even being seen by your fans! Let’s be real for a minute: the organic reach on social media has been in a steady rate of decline since 2014 and is set to get worse. The Big Four of social media: Facebook, Instagram, and to a lesser extent Pinterest and Twitter - all want you to “pay to play” meaning that in order to reach the followers you have, you need to spend money on advertising to reach them. The truth is you don’t need to have a big social media following to run a profitable business. I know many people who run hugely successful businesses with either a limited social media presence or not one at all. Last year I had to re-evaluate how I was using social media as I realized it was having zero impact on growing my actual business i.e where my client base was coming from. When I did an audit of where I was spending my time, it became obvious I was spending significant time not only creating content for social media, but then hours and hours of engaging with people on the platform - and I had little to show for it! Which begs the question - is investing time on growing your social media following even worth it? My answer is if you’re a solopreneur or creative business owner, then, no. Social media numbers are all vanity metrics. Social media fans, likes and comments are all vanity metrics, which means they’re numbers that may seem impressive to some people but don’t actually tell you anything about the health or success of your business. The real metrics you need to focus on as business owner are the conversion rates from your various marketing efforts and the actual sales numbers in your business. The question to consider is: can I directly measure the number of clients who have discovered my business and booked my services via social media? If you can safely say that the majority of your referrals and business enquiries come from social media - then great, keep doing what’s working for you. But if not, it may be a sign you need to re-evaluate things. As a solopreneur your time is your greatest resource. As solopreneurs, time is our greatest resource. We wear multiple hats in our business: everything from marketing, accounting, client services, administration - there’s a never-ending list of things we need to do to keep our business running. Until we’re at the point of hiring help, then we need to assume these roles ourselves. This is why it’s so important we’re intentional with our time and only focus it on activities that are going to drive us forward. You don’t own the data. I hate to break it to you, but if Instagram changes it’s algorithm tomorrow or YouTube shuts down, and that’s where your audience is - your business will be in trouble! While you may be accumulating fans and followers by growing your social media numbers, you don’t own the data which means the only method you have of connecting with your fans is via the platform they are following you on. And with organic reach steadily declining, it’s not a good use of time to be investing in marketing efforts where there’s such a low chance of people even seeing your content. I liken it to building your house on someone else’s land which is a disastrous idea. Social media doesn’t make you feel good. Who goes on social media and afterwards feels amazing?! Nope didn’t think so! The truth is seeing other people’s highlight social media makes you feel like crap and leaves you in a constant state of comparison on how you measure up against other people. Even worse, is when you start measuring your worth by the number of likes you receive and the number of followers you have - I’ve been there and it’s a dangerous game that never ends well! In fact, there are multiple studies to support linking spending time on social media with increased rates of depression and mental illness. The paradigm shift: using social media with intention. Making this simple tweak to your content strategy will allow you to to reclaim your time and focus it on what is going to build the most traction for your business AKA getting clients. Instead of approaching your contention creation from a platform-first basis i.e Instagram, Facebook, YouTube, Twitter and Pinterest - shift your focus to make your website and blog the centre of your online universe and take a top-down approach where everything you share on your blog is then amplified across your various platforms. In the case of where you’re creating podcast content which is consumed on another platform i.e iTunes, you should always have that link back to your blog in the form of a show notes style post, so you can still drive your audience back to your website and reap the benefits from this. This means that by coming up with a content calendar for your blog, which let’s say you publish one blog post each week, you can then spin-off and re-purpose into various pieces of content to share across your other platforms throughout the week. Instead of having to come up with bespoke content for all of your platforms, you can reduce your focus to just your blog which is going to save you a whole lotta time! Boost your SEO: creating regular content on your blog means you’re automatically helping to boost your SEO (organic search traffic) - Google LOVES fresh content. Build your list: fresh content on your blog gives people a reason to visit your website, which means you have the opportunity to get them on your email list by subscribing to your newsletter - you own this data which makes it far more valuable than social media followers. Claim your expert status: the more time you can dedicate to creating quality long form content on a website domain you own that people can easily share with their network, helps to position you as an expert in your niche. This approach allows you to see social media for what it really is - a great way to make connections with likeminded people, share your message - and have fun! If you’re not having fun with it and it’s causing you stress - then it’s a sign you need to make a change. Your goal with social media should be to let people get to know you AND get them to join your VIP party AKA your email list. And remember, focus on your zone of genius and ditch, automate or outsource the rest! So, tell me: is social media helping or hindering your success? How will making this shift change the game for you? Grab your FREE copy of Little Brand Book with the six step system to get clarity on your message, so you can create a rock solid foundation for your brand and start attracting your dream clients. Find your zone of genius: how to unearth your unique gifts & own them.